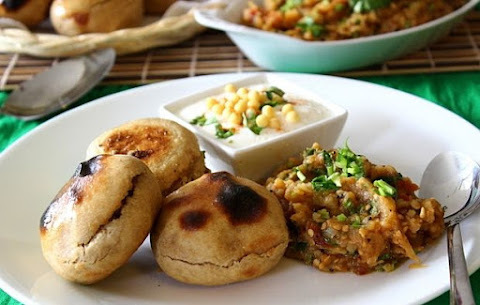 Litti Chokha is a traditional Snack found in India Northern States of Uttar Prades, Bihar and Jharkhand. It is eaten as an evening Snack during Winter prepared on Cowdung Fire. Though it can be enjoyed all year round. Litti Consists of Wheat / Sattu formed into balls filled with a mixture of Spices. Chokha is Mixture of Roasted Brinjal, Potatoes and Tomatoes served with the Litti. 1. Remove the Skin of the Boiled Potatoes and keep aside. 2. Roast the Brinjal and Tomatoes on the gas Flame until they become soft. 3. Peel off the burnt skin of Brinjal. 4. Now Mash the Boiled Potatoes, Brinjal and Tomatoes along with Garlic. 5. Add Finely chopped onion, Grated ginger, Coriander leaves, Green chillies, Salt and mustard oil. 6. Mix all the Ingredients Properly. Now your Chokha is ready. 1. Sieve the Flour in big bowl.To that add carom seeds,Salt as per taste and oil. 2. Knead the dough properly with water.It Should be Soft. Cover it with Wet Cloth and keep aside. 3. If Sattu is not Available, Grind Chana with Black Pepper. 4. Take the mixture in a Mixing Bowl and add in Grated Ginger, Green Chillies, Coriander, Lemon Juice along with all the Spices and Mix Well. Keep aside. 5. Now take the dough and make small Chapatis. 6. Now take the filling mixture prepared above and place in the middle of the chapatis and pinch the chapati from all sides to make a ball of chapati filled with the filling mixture. 7. Similarly make 10-12 balls. Litti is ready for Cooking. 8. We can either bake these Litti's in a preheated oven at 180C or Roast in Goithas (Burnt cow dung cakes)/Coal. 9. Bake/Roast till one side is brown and black spots start to appear on the Litti surface. 10. Then turn over the Litti and bake/roast for a few more minutes until this side is brown as well. 11. Litti is ready for Serving. 12. Dip Hot Litti in Pure Ghee or Butter and Serve with Chokha and Green Coriander Chutney or Boondi Raita.